Celebrities makeup games are strong, but I've got to chalk that up to their teams of makeup artists. Some, however, have a true love of cosmetics like Gwen Stefani who's releasing a palette with Urban Decay, but she's not alone. 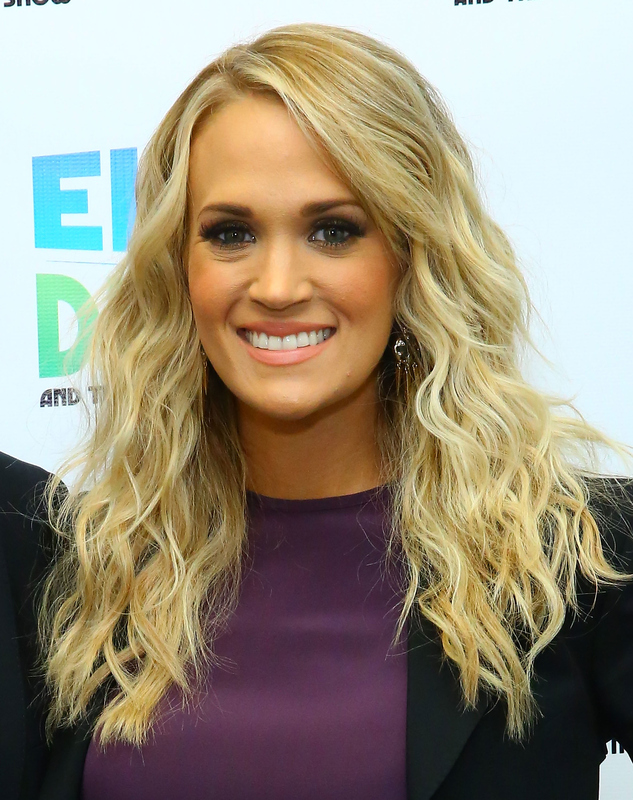 Almay spokeswoman Carrie Underwood even wears makeup when exercising and lounging around the home. While I love feeling confident with my makeup game strong, even I've got to admit that not letting your skin breath doesn't seem like the greatest of ideas. While the habit is questionable for her skin, her reasoning isn't altogether flawed. Many celebrities have poor skin habits. On the last season of ABC's The Bachelor, contestant and future bachelorette — kind of — Britt Nilson wore makeup to bed. It turned out to be a good choice since bachelor Chris Soules woke her up in the wee hours of the morning, and she just happened to be rocking her signature red lip. Recently, Kim Kardashian admitted that celebrity makeup artist Charlotte Tilbury was her idol because she didn't allow her husband to see her without makeup. Basically, a lot of celebs are doing questionable things when it comes to skincare, and you can go ahead and add Carrie Underwood to that list. Underwood spoke to PeopleStyle about her beauty routine, specifically her relationship to makeup. Underwood, who is known for doing killer workouts, admits that if she's going to exercising in public, she's going to add a cosmetic touch to her face. She explained, "If I’m going someplace, I always think, ‘Somebody’s going to see me and want to take a picture with me,’ which is really great, but I hate it when I see the pictures later when I wasn’t wearing any makeup at all. So I’ll throw on a little bit — some foundation, a little bit of Smart Shade, maybe a little bronzer and mascara and I’ll be OK. I won’t feel bad about my pictures if I do that.” While wearing makeup during a jog may not be the greatest of ideas, the impetus behind the choice makes sense. Underwood is, after all, a celebrity, and if makeup allows her to feel more confident in photos with fan, then she should go for. The star also admitted that she rocks a bit of makeup even when hanging around the house. She said, "I’ll always put makeup on, even if it’s just a little bit...I’m an eye girl. I’ll always put on a little eyeshadow, a little liner and mascara and I’m good to go.” I don't know about you, but I'm not one to rock rock makeup unless I'm headed out, and while Underwood's skin is still clearly perfect, letting your breathe definitely needs to happen. If you're like Underwood though and like to rock a minimal look when off duty, there are a couple of products that give you a no-makeup makeup look and are actually good for your skin. This incredible cushion will provide a natural, dewy look to your skin but is also hydrating, contains SPF, and infuses the skin with antioxidants. I'm a Philosophy junkie, and this product is incredible. It is a multi-tasking cream with a slight tint that acts as a moisturizer, primer, and sunscreen. This dual ended cream has a moisture giving and skin enhancing cream as well as a tinted concealer. It's basically the perfect product. Those with acne prone skin have been taught that wearing makeup for too long will only make things worse. However, this BB Cream is perfect for those with blemish issues who want to rock makeup all the time. The LipSurgence Lip Tint from Tarte is perfect if you suffer from dryness. This moisture granted lippie is ideal for all the time wear with a hint of color.